This garden was influenced by Renaissance and Baroque formal gardens. High hedges and walls create a self-contained area that draws the eye inward. Formal components include topiary features, low box hedging, yew hedging and a line of pleached hornbeam to the rear of the boundary wall. These elements give a reassuring impression of established order and contrast with the looser shapes and bright colours of the climbers, colour-themed herbaceous plants and large specimen shrubs. The willow pool is the focal point of the garden – a dynamic water feature where sculptural fish jump up stream. Based in Manchester, Barnes Walker is a highly respected landscape design consultancy who are well known for producing high quality gardens. 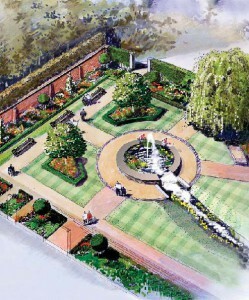 They have undertaken the masterplanning and detailed design of the new Springfields Festival Gardens and have designed and built the Formal Garden. The practice offers a full range of Landscape Consultancy services. Of particular value is the practice’s ability to work at different scales, as demonstrated by their work here at Springfields.